With one hand locked onto her ear as she is diligently conversing on phone with someone, she signals the driver with the other to leave after dropping the kids at the gate. Kids being all day at school, must have missed their ‘guardian angel’ who would help them freshen up and feed them with their favorite meal they can’t wait to have after a long tiring day! With welcoming happy faces, they dotingly rush towards her. She couldn’t resist but have her friend excused and then hang up the call immediately, as this precious bonding moment rarely happens and she wanted to embrace it, and embrace them into a tight hug! But to her shock, they moved past her and instead ran into their nanny who was (as she always does probably at this time) standing just behind her, to give her a hug! You must have probably come across a video portraying something similar which actually influenced me to write on this crucial topic. It is actually a “reality check” moment if you are or anyone you know is in similar situation. More than half of the households in Saudi Arabia rely upon outsourced childcare which is shockingly a big number, specially because the ladies here are mostly not working-women. This increasing trend also has a direct influence on upbringing of a child. Just think about it, in these recent times haven’t the kids become more unruly and frantic? 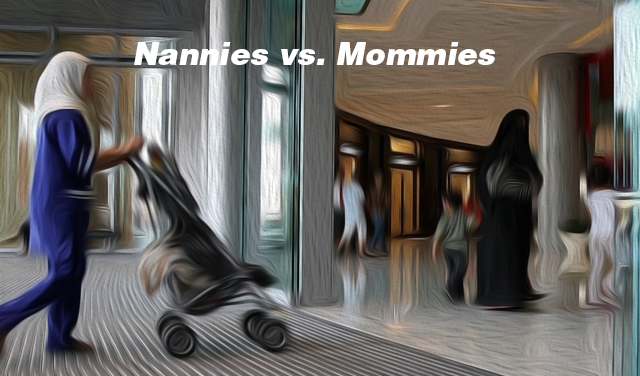 Though, keeping a housemaid or a full-time nanny has been an essential since decades. Saudi parents specially sponsor visas for domestic help from abroad. Ridiculously enough, within the kingdom you will find 90% of job vacancies for females related to ‘full-time housekeeping’ services. Whether it is a shopping center, hospital or a restaurant, finding a foreign face being led by the local couple shouldn’t be much of a surprise anymore. And that timid-looking foreigner most probably is either strolling around a little one or carrying heavy bags of shopping spree indulgence of the lady in lead. Funnily, this neglect frequently becomes the cause of embarassment for parents who don’t know how to mind their own children at a restaurant or at any recreational venue, where the child starts showing his/her tantrums (which unfortunately can’t even be controlled by the maids as they are expected to just be like dummies) and create inconvenience for other families on the spot. This complete dependance on a stranger for rearing can also have a long-term damaging impact on the child’s physical and mental health. Parents are often unaware if their child is getting proper nutrition or are being taught proper hygiene practices. Given the maid is most probably from a poor uneducated background, there will always be a lag in the child’s vital development needed for learning and cognitive processes in that small age. Factors that add into personality development like morals, values and etiquettes which are passed onto by parents, stay amissed. And the horrific possibility of the child getting mishandled or exploited? Let’s not even go there! Result is: Irresponsible, confused, agitated and insecure person. Are the few minutes of freedom and leisure at the cost of your child’s crucial years of upbringing worth it? Is being responsibility-free so tempting that you choose to believe your child doesn’t deserves an affectionate tucking up into his/her bed and getting fed with your own loving hands? Quality time should not be limited to just momentarily carrying your child. Let them bond with you so they trust you rather than the unknown member who is not part of the family. And that can never happen if the parents stay consistently unavailable.